So simple, but soooo effective! My friend, Lois, brought this cute ATC along with a gorgeous origami ornament she made (this is one clever gal!) for our Wednesday sewing get-together with a third friend, Audrey. We so enjoy our time together, though we don't always sew..... Yesterday, Audrey addressed Christmas cards, I wrapped gifts, and Lois told us more about a recent trip she had taken. We practically inhaled the Yule Log cake, and had a nice mug of hot tea to go with.....chatting all the while! Santa and his frosty blue background glitters and has two tiny seed beads for his eyes. You girls had a lovely time - and that yummy Yule Log cake! Cute Stuff! Hey you won a prize on my blog but I need an addy to send it to! My email is on my blog! LOL! Merry Christmas! 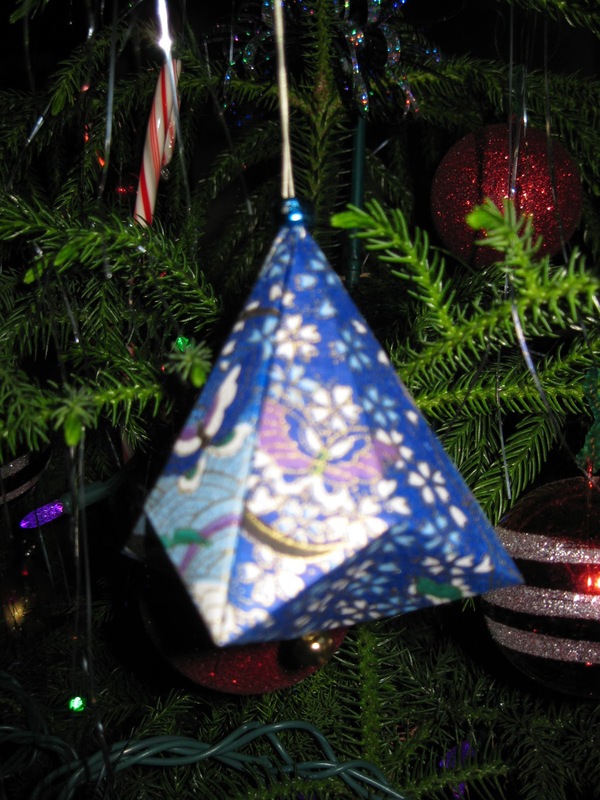 Love that origami ornament!! The paper is gorgeous!! Have a wonderful Christmas weekend! !